My cousin just came from Japan the other week. 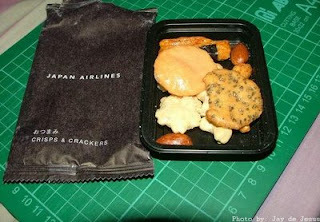 She flew in via Japan Airlines and they gave this snack to passengers during the flight. She gave it to me instead. The packaging says "Crisps and Crackers". That alone made me wonder what's inside. I was surprised to find a variety of bite-size knacks. The black container is as big as an iPhone. It had some nuts and chips and I have to say it was mighty tasty. I wonder if you could buy something like this in the supermarket. 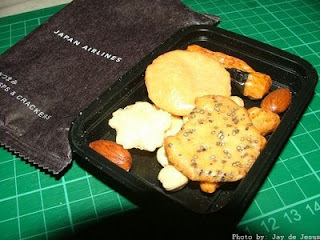 I don't want to have to fly Japan Airlines just to taste this again.